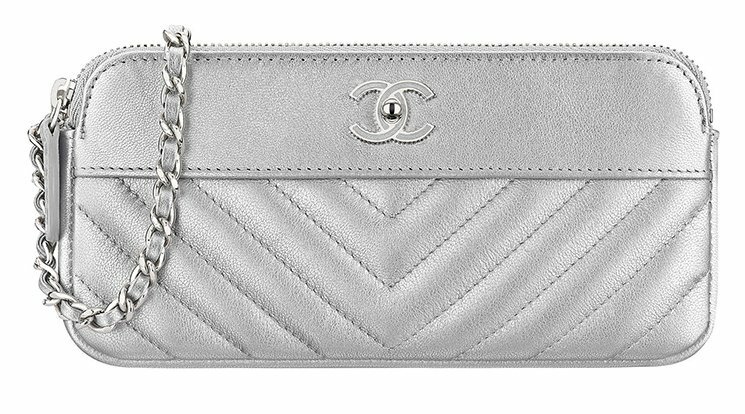 The Chanel Smooth Chevron Clutch with Chain is introduced for the Fall Winter 2017 Collection Act 2. The design of part quilting and part smooth leather reminds me of the Small Gabrielle Bag or the Gabrielle Clutch with Chain. You see, exterior of the Gabrielle Bag is also made in smooth leather, but only the bottom part. This new mini bag is crafted in smooth leather on the top part. I love unique and seasonal bag that looks timeless, because not many people will be carrying it. The Smooth Chevron Clutch With Chain is one of such handbag. Built in metallic for the shiny effect, the sheepskin leather is impeccable and durable. The bottom part of the bag is crafted in chevron quilting for the classic look and the top is made in smooth leather for the modern touch. It comes with the signature woven chain strap and in the center it features the smooth CC logo. The metallic shade in combination with the silver hardware are the perfect pair as it creates a balanced flaunting effect. The Clutch with Chain is not a new bag; we’ve seen the same bag in full diamond quilting or full chevron quilting style. There is even a Boy edition, however the mix of chevron quilting and smooth leather is new. This small-sized bag is ideal for the evening or at days when you don’t feel like dragging an oversized handbag. It opens with a top zipper and inside you can find the main compartment to store your mini essentials. The style code is A70118 and it measures 3.9’ x 7,5’ x 1.6’ inches, priced at €1450 euro, $2360 SGD, 7290 MYR, $1475 USD, £1310 GBP, $12100 HKD via Chanel boutiques. We’ve seen a lot of Clutch with Chain these days and there are even signature designs like the Classic Quilted and the Boy edition. The function of the Clutch With Chain is very similar to the WOC, so we’ve created a special post to compare these two. Read more via here.